Sold by Prime Options and Fulfilled by Amazon. Gift-wrap available. MANY APPLICATIONS: A. Reduce 95.5% of hair loss, making your house cleaner and healthier (less allergies). B. Gets rid of mats without hurting your pet, helping to prevent future fur loss. C. Removes dander, knots, tangles. D. Increase blood circulation and make your pets coat soft and shiny. E. Combs and removes the loose hair. F. Others. 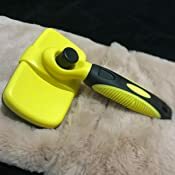 EASY TO CLEAN: WITH ONE CLICK fur-ejector allows you to quickly and EASILY REMOVE shed fur. 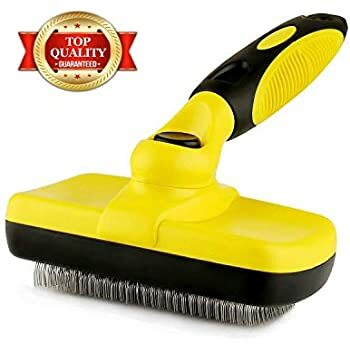 The round button on the handle operates a very simple and yet creative mechanism for releasing all the dead hair and debris that the brush picks up. 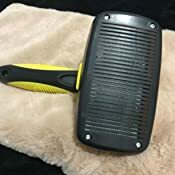 The retractable bristle design keeps the grooming brush safe and easy to store in your grooming kit when it is not in use. 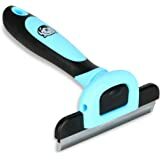 SUITABLE TYPES OF PET: This brush is suitable for animals- especially dogs with medium and long fur. It is not suitable for animals with very short hair since the brush teeth are a little thin and may feel sharp. HIGH QUALITY MATERIAL: Brush is specially developed for best performance on grooming. 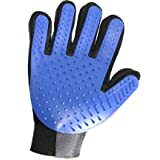 Durable ergonomic soft grip handle, with soft anti-slip grid. Bristle made with stainless steel preventing rust. Sold by Prime Options and ships from Amazon Fulfillment. Easily track your pets during evening hikes, walks. Be seen by moving traffic and save your pets life! Collars made of high quality durable polyester, built to last. 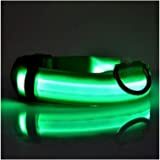 - Made of stainless steel and plastic: quality and durability. 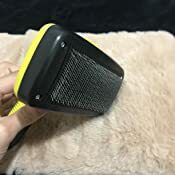 - Simple to use: After brushing your pet, simply click the button and the bristles will go in, and the hair will wipe off instantly. - Comfortable and Non-slip Ergonomic handle: best performance on grooming. - Your pet will not only look good but feel great too! Your pet will love being brushed! 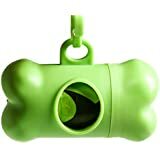 - For medium to large dogs or cats. 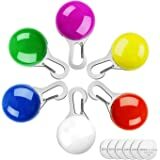 - Keep it away from children to avoid be hurt by the steel pin. 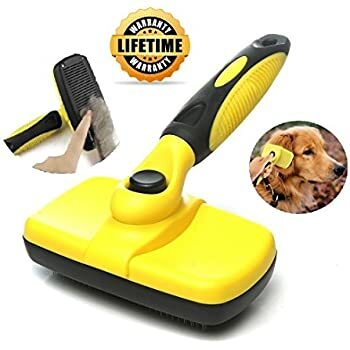 Why Prime Pet Slicker Brush? - High quality at an attainable price. 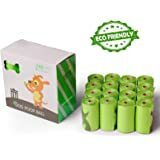 - Exceptionally safe for your pet. - Safe for indoors & outdoors. Visit Our Store for more Products! 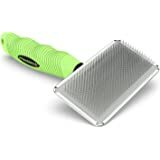 I wish I had invented this tool because it is the best dog grooming tool for pet owners. Push the black button on the handle and the wire bristles extend. 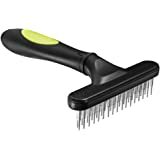 Brush your pet and the fur gathers in the perfectly spaced bristles. Keep brushing until the brush is full. Push the black button again and the bristles retract. The fur falls off the brush into the thrash. Even the thick undercoat is lifted out. My husky dances around when the brush comes out in joyful anticipation. 5.0 out of 5 starsWorks as advertised! This brush is definitely the one to get. We have two larger dogs, one with long hair and the other with a very thick coat. 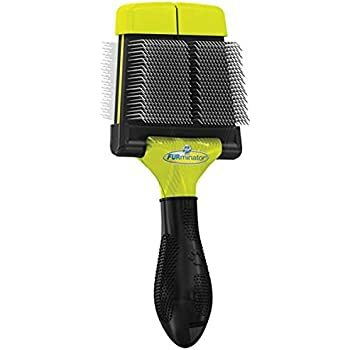 The metal 'bristles' are not really sharp to the touch like others can be, and without even applying pressure I was able to remove a good amount of hair/fur from our dog with the the thicker coat after using/cleaning it 4 times. I also tried it gently on one of our short-haired dachshunds and it did not hurt her. We are very pleased with this purchase! 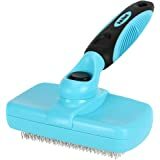 This brush has changed the brushing game for sure, cleaning the kittens brush can be a challenge.. so many tiny little hairs. This brush makes my life soo much easier.. it’s unbelievable.. Just one push of a botton and that’s it, you are done. 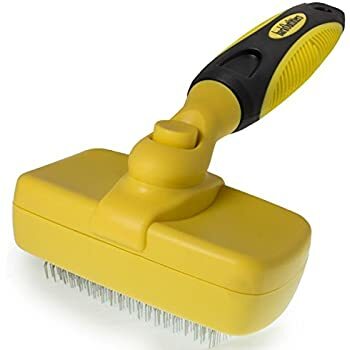 I have always had issues with slicker brushes because of the cleaning issues. On one side brushes are highly effective to remove the hair. However, it becomes a pain to remove the hair from the brushes without damaging the bristles or even my hands. This brush has worked perfectly for me! It is at least 10x better than any other I have tried on the market! 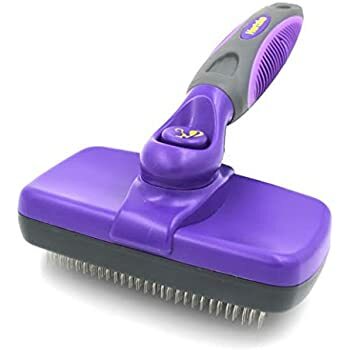 Once I pull a decent amount of hair from my cat, I simply place the brush on top of a trash can, press the button and the hair from the brush will fall into the trash can without having to touch it! Additionally, it my cat loves it, it seems as if the brush is massaging my cat! 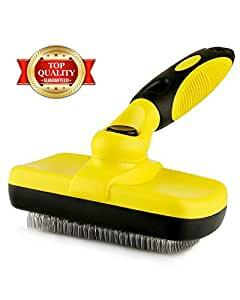 I really like this self-cleaning Slicker Brush. I used it on my Sheltie that sheds a lot. It gets the undercoat out and keeps down the shedding. It's easy to clean also. Very good one. Better than the other brushes. When the ​button is pressed, bristles are locked in place for brushing (most tried do not hold). When pressed again, and bristles are back inside, hair completely falls without having to pull it with my own hand! Dog can't get enough of it. 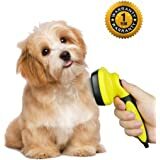 My bulldog love this hair removal and scratching device? 5.0 out of 5 starsWe bought three! So handy for keeping cat hair under control. 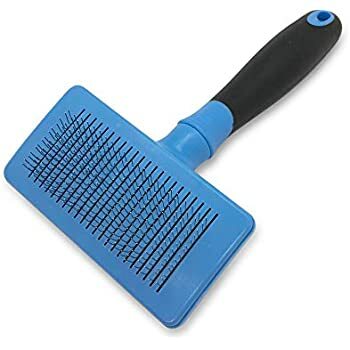 Our cat loves to be brushed with this tool. Especially nice to clean out hair from bristles.